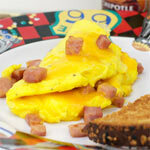 This recipe for Omelettes was submitted by kimber177 on 9/30/2003. Click here to view the recipe. I'm lazy. I just put the spinach on the omelet and topped it with the cream cheese. I like my eggs cooked slightly brown, so the spinach gets warmed through. I also like some chopped parsley mixed in with my eggs. You can skip the cream cheese and this still tastes great. AMAZING! Good for relaxation time and on the go. 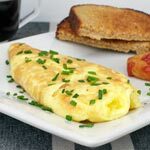 Go ahead and try this omelet yourself, you will fall out of your seat! Added green onion and red pepper flakes! Salt and pepper to taste! Great way to open up breakfast for my diet! It's best if you wilt the spinach just a little first to make it more tender. Just put it in a covered sauce pan on medium heat with just a Tablespoon or two of water. Pat the spinach dry before adding to the omelet. It's really good. This is really good. I added green onion and tomatoes to the eggs. 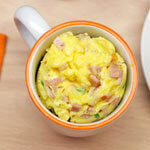 I will use this recipe again! I would also like to thank Kimber177 for this recipe. It is very good. I even like spinach cooked this way. Thanks! Awesome recipe. Great filling. Easy to make. This was really good. Thanks for the recipe. I thought it was very good and a nice variation. 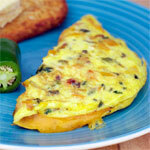 Add a little water to your eggs when beating for a light and fluffy omelet. I salt and peppered mine. I calculated it at 4 carbs: .39 per egg, 1.5 for cream cheese and 1.7 for spinach. Not trying to offend anyone, but there is nothing healthy about using a microwave. I am very disappointed that you do not present the net carbs. I would never use a recipe that does not give the net carb total. I substituted the cream cheese for 1/4 of a tomato (diced) coupled with a teaspoon of ketchup to make it smoother. I also microwaved the egg instead of frying it as a healthier alternative. I must say, this was really pleasing to both the tastebuds and the tummy. Thanks for the wonderful idea. This was good. I used 3 eggs per omelet. Also used cooking spray. Wish I had sesame seed oil. that sounds good. This is totally great. Everyone should eat this! I used chopped Spring salad mix from a bag and honey walnut cream cheese. It was all I had when I came upon this recipe. My taste buds are still reaching a verdict. I added a handful of crumbled turkey bacon and some finely chopped onion to the cream cheese and spinach. AWESOME!!! I used egg beaters and low cal cream cheese for a low calorie meal....DELICIOUS! Awesome! Only change was to add a tiny touch of bacon bits. I usually do not care for eggs but this is a keeper. Accolades! I added a little bit paprika and parsley and it is absolutely delicious! Thanks for the recipe. It's definitely yummy and nutritious. 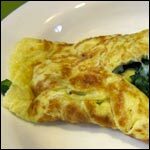 I love eggs and spinach, and I never thought of putting them together. Very good!